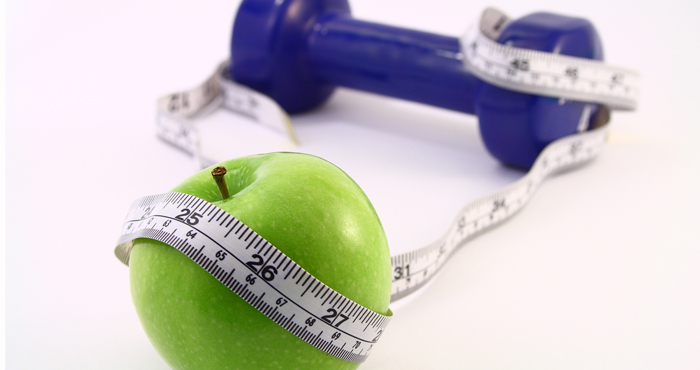 Looking for a way to get back on track toward meeting your fitness goals? Some fitness apps not only help you reach your target weight, nutrition, and activity goals but let you earn cash as well. In addition to sweat equity, you’ll have to put in a little effort to get your payout. Some of these fitness apps automatically sync to third-party fitness or food trackers. Others require you to take pictures to show visual proof of your healthy habits. If you meet your goals, you’ll be rewarded with cash, gift cards or product discounts from major retailers — and the congratulatory remarks of friends who’ve followed you on your journey to wellness. DietBet takes the office pool and turns it on its head. Join a current “game” or start your own, and challenge your friends or connect with strangers. There are two game levels: Kickstarter and Transformer. In Kickstarter, after four weeks, whoever’s lost 4 percent of their body weight splits the pot of money. But since no one’s trustworthy in the digital space, DietBet requires all gamers to submit their official starting weight two days before the game begins by uploading a full-body photo standing on a scale plus a second photo of the scale’s readout screen. You have 28 days to lose the weight while participating in self-reported weigh-ins and cheering on your friends with more photos and comments. Once the four weeks are up, you’ll have another two days to submit your end weight; you’re only required to submit photos if you’ve won the game. Transformer’s rules are similar to Kickstarter’s. You have six months to lose 10 percent of your weight. Interim goals and prizes are offered every week or month. Winners are notified via email. Use winnings toward new DietBets, or cash out via PayPal. Since DietBet understands that money can be tight, they’ll forfeit their cut in order to ensure the winner(s) don’t lose any money. (DietBet’s fee ranges from 10 to 25 percent of the monthly bet before paying out the winners.) Still not sold? Try a game risk-free for seven days, and if it’s not for you, they’ll issue a full refund. RunBet is similar to DietBet in that you pick a "Game" and place a bet on yourself. Games last four or six weeks and have different goals, ranging from "Becoming a Runner" to "10K Trainer." You're presented with your training schedule, including the number of days you can take off, so there won't be any surprises. And since there's money involved, you'll need to verify your runs. 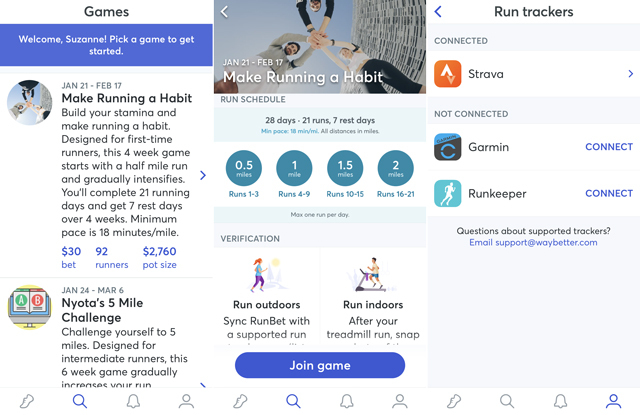 If you run outside, the app will pull in data from runs logged by Garmin, Runkeeper and Strava apps. If you run indoors, you'll need to take a photo of the readout on the treadmill and a "sweaty selfie." If you finish all of your runs and they've been verified by RunBet, you'll be declared a winner. The pot, which is funded by participants who didn't finish the game, is split between all of the winners. RunBet keeps 15-25 percent of the gross pot, but if there are a lot of winners, you won't lose money. If you are a winner, you'll always get at least 100 percent of your bet money back. Winnings are deposited in your account as points and can be used for future games or cashed out via PayPal. You have until day 7 to receive a full refund if you decide the game is not for you. If your goal is to live a more active lifestyle (or maintain it), StepBet may be your best option. Select one of the six-week games, place your required bet (usually $40) and meet your step goals. Some of the games will have extra perks, like the opportunity to win extra prizes, so take a look through for the one that best suits you. For most games, you'll have four "Active" days, two "Power" days and one day off per week. The first week of every game is a "warm-up week" and you won't be disqualified from winning if you don't meet your goals. You can also get a full refund within the first 7 days, if you decide to quit the game. You step goals for your Active and Power days are calculated by StepBet and based on your step history. So if you're already getting 10,000 steps per day, your goals will be high. Steps are tracked by connecting an approved activity tracker to StepBet. You can choose to pull in data from Apple Health, Apple Watch, Fitbit, Google Fit and S Health (including steps from S Gear devices). 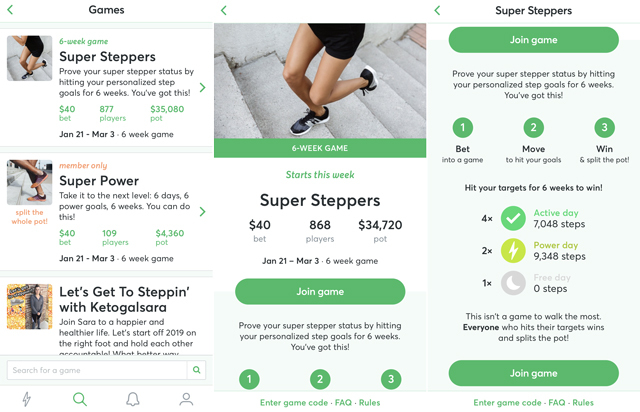 If you meet all of your step goals and they've been verified by StepBet, you'll be declared a winner. Winners split the pot, which is funded by participants that don't meet their goals, minus the StepBet administration fee, which is 15 percent of the pot. Like DietBet and RunBet, StepBet has a No Lose Guarantee, so at a minimum, you'll get the money you bet back. Winnings are deposited in your account as points and can be used for future games or cashed out via PayPal. StepBet also offers a membership plan for a little less than $5 per month, based on a yearly fee. Membership entitles you to play in up to three games simultaneously and members-only games, where you split 100 percent of the pot (no StepBet administration fee). HealthyWage reminds me of a pocket-sized version of “The Biggest Loser” show. 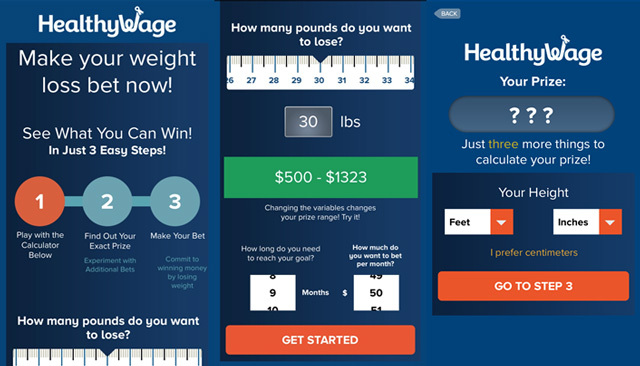 HealthyWage starts your weight loss journey by encouraging you to calculate your winnings before you commit to a challenge. 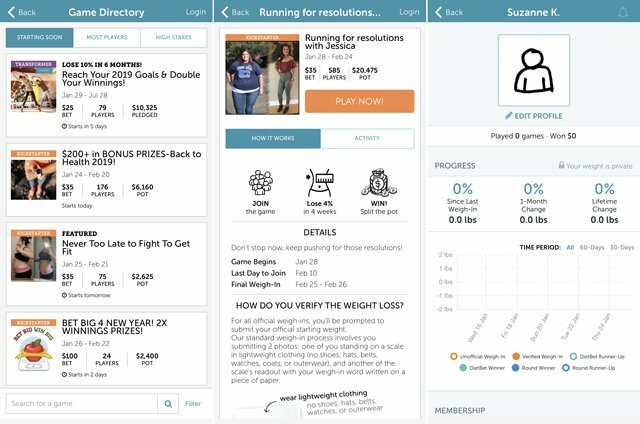 Use the built-in calculator to enter how many pounds you want to lose, how long you need to reach your goal and how much you want to bet per month. Weight-loss goals range from zero to 200 across six to 18 months, and you can wager $5 to $995 per month in $5 increments. For example, you could win between $500 to $1,324 if you lose 30 pounds over nine months on a bet of $50 per month. HealthyWage gives bigger prize offers to people who statistically have a hard time losing weight, based on BMI, time of year, how much you want to lose and other factors to get an exact payout. And, you have to be looking to lose at least 10% of your body weight. If the prize estimate sounds like a winner, move on to enter your personal information such as height, weight and waist size. At that point, you’ll see your exact prize amount. My information produced a prediction I’d gain $169 with a return on investment of 37.66%, for a total prize of $619.45 on a bet totaling $450. The clock starts ticking once you enter your official weigh-in; weigh out during the last two weeks of your challenge. To verify your weight, upload a weigh-in video or video chat with a HealthyWage rep so they can witness your weigh-in. To stay on track during the challenge, participate in unofficial weekly weigh-ins. While they’re not required, weekly weigh-ins are encouraged to prevent fraud among contestants. While you’re limited to just one HealthyWager at a time, you can actually participate in up to 10 team and jackpot challenges at a time. You earn HW Points for winning a challenge, which can be used to pay for future challenges or cashed out. Winners are typically paid within 2-5 days via PayPal or 1-3 weeks via check. What stands out about this app is the people at HealthyWage seem committed to enforcing strong contest regulations and ensuring everyone loses the weight in a healthy manner. Pregnant participants are disqualified but can postpone a challenge until a future date. There’s even a yo-yo rule to help previous winners who may have regained their weight, designed to keep them from repeating their weight loss in an unhealthy manner. Professional athletes, bodybuilders and trainers who have earned more than $5,000 in contests or by providing weight loss training services over the last five years aren’t eligible to participate. If losing weight is your focus and getting multiple trackers to talk to one another presents a headache, consider HealthyWage for the simplicity of its design. While you may use a fitness tracker to count steps and calories, there’s no need to connect to HealthyWage in order to win big. Just lose the weight to earn your prize. With Sweatcoin, you get paid to walk. The app uses your phone's GPS and built-in accelerometer to track your steps and your steps get turned into Sweatcoins (1,000 steps convert to 0.95 Sweatcoins and they take a 5 percent commission). Sweatcoins can then be turned into purchases in the Sweatcoin marketplace. There you'll find discounts on goods and services, products for purchase and a few "Marathon Offers" for expensive products, like an iPhone Xs and $1,000 cash (both cost 20,000 Sweatcoins). There are a couple of caveats. First, only steps taken outside count because Sweatcoin uses GPS to verify the steps you take. According to Sweatcoin, on average only 65 percent of your steps will count. Second, you can only earn up to 5 Sweatcoins per day unless you subscribe to Shaker, which costs 4.75 Sweatcoins per month. 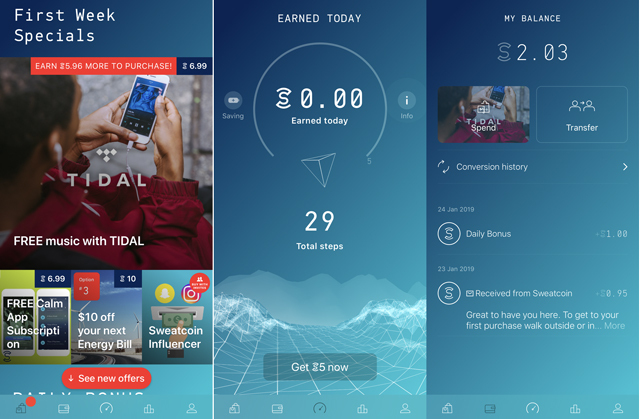 With Shaker, you can ear up to 10 Sweatcoins per day or 300 Sweatcoins per month. Still, that means be able to claim one of those Marathon Offers in about 5.5 years. Walgreens is one activity tracker you don’t have to think about when it comes to redemption terms. 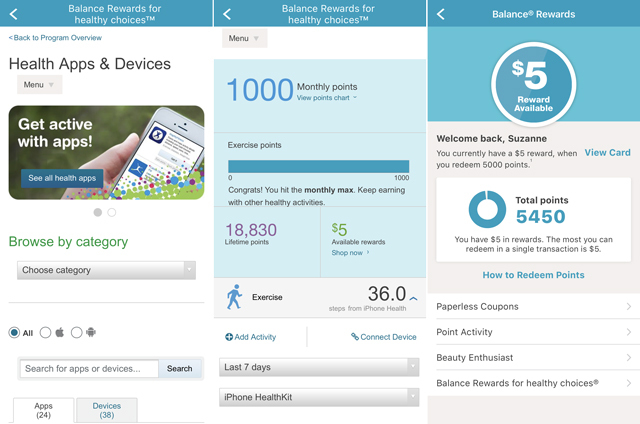 The Walgreens app serves as an activity tracker, membership card, sales circular and prescription refiller all in one. With each healthy step you take, you’re on your way to earning Balance Rewards that can be redeemed like cash at any Walgreens store. It’s easy to be greeted with a nice surprise from the cashier stating you have a reward available that you can apply toward your purchase. Not sure how all of those points add up? Go to your activity log to see which healthy activities are raking in the small bucks. Walgreens can connect to 24 health and fitness apps, including HealthKit, Google Fit, Withings Health Mate and Runkeeper and 38 different devices, including Fitbit activity trackers and Omron blood pressure monitors. If you have health issues, you should avoid these apps altogether. “Users might push past their limits in order to earn that extra buck, risking illness or injury, and might not take sufficient rest/recuperation time,” warns clinical psychologist and certified personal trainer Stacey Rosenfeld. But those who like to exercise for the challenge may find incentive apps intriguing. Wondering if you have ever installed the Sweatcoin app. Think your readers would enjoy it.